One of the most well known of the fast food diets is the Subway Diet which was made popular by a man named Jared Fogle. Equipped with Subway's nutritional information, he lost 245 pounds in one year. Since then he had been dubbed the Subway Guy. This is just one of a vareity of fast food diets and even in this case there is more to the story. Dinner: 12-inch Subway veggie sub (still no oil, mayo or cheese) with a Diet Coke. In the first three months he last 94 pounds and started walking. In less than a year, he had lost 245 pounds. This diet amounts to about 1500 calories a day which will cause steady weight loss for most men. 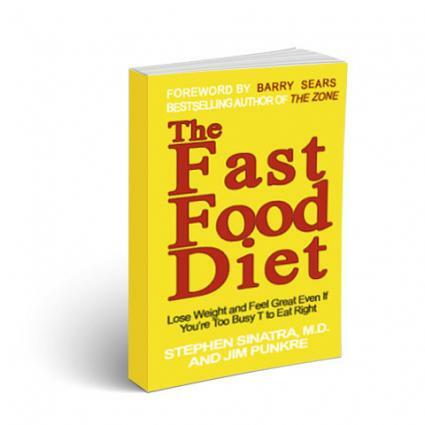 Dr. Stephen Sinatra authored the book The Fast Food Diet, which takes a healthy approach to fast foods. If you are an on-the-go kind of person who eats out often, this might just be a weight loss plan that can work for you. The premise of the diet is to learn how to make the best choices from fast food menus and to add exercise into your daily routine. The book offers support and information to equip you to know what to buy whether you're at a restaurant, food court, airport or convenience store. Dr. Sinatra admits he would prefer people eat a healthy balanced diet including fresh fruits, veggies, whole grains, lean meats and low fat dairy, but he also realizes this doesn't work for everyone. He has designed this diet for people who love fast food and need to lose weight. It eliminates fried foods and sugary drinks from your options and encourages foods like grilled chicken sandwiches, junior burgers, chili, baked potatoes and more. This diet is more than a list of dos and don'ts. It teaches dieters how to make healthier fast food substitutions, how to reduce fat intake, and, of course, how to reduce calorie intake. In general, the diet is a 1500 calorie diet plan that includes walking a mile each day. Order a healthy side dish such as a small salad (this is a better choice than fries), however, pay attention to the salad dressing you add. Some dressing are so full of fat that you might as well order french fries. Consider a large salad with grilled chicken and a low-fat dressing. Drink water. Many people don't drink enough water. It's the best beverage to drink with your fast food meal. Zero calories and it's good for you. If you want to treat yourself to something other than water, consider unsweetened tea or diet soda. It is possible to make healthier choices even at fast food restaurants. Diets like the Subway Diet and the Fast Food Diet help people learn how to make wiser menu choices, how to cut back on portions and encourage regular exercise.